Nanotechnology and Biosensors shows how nanotechnology is used to create affordable, mass-produced, portable, small sized biosensors to directly monitor environmental pollutants. In addition, it provides information on their integration into components and systems for mass market applications in food analysis, environmental monitoring and health diagnostics. Nanotechnology has led to a dramatic improvement in the performance, sensitivity and selectivity of biosensors. 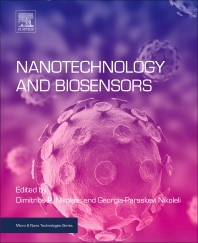 As metal-oxide and carbon nanostructures, gold and magnetite nanoparticles, and the integration of dendrimers in biosensors using nanotechnology have contributed greatly in making biosensors more effective and affordable on a mass-market level, this book presents a timely resource on the topic. Dimitrios P. Nikolelis is Professor. of Analytical and Environmental Chemistry at the University of Athens, Greece. The co-ordinator of several Europe- and NATO-wide research projects focusing on biosensors and nanotechnology, and has also served as Editor-in-Chief of five peer-reviewed journals. Georgia-Paraskevi Nikoleli is based at the Laboratory of Inorganic & Analytical Chemistry, School of Chemical Engineering, University of Athens, Greece. Her research is in the area of nanotechnology, looking at multifunctional new materials and the production of processes and new devices.